And the great rubber band remedy. Would you prefer to listen to this chapter instead? Click below. Do you remember the I Love Lucy episode when Lucy and Ethel get a job in the chocolate factory? At first they manage to keep up with the conveyor belt and then, as it gets faster, they miss a few, pocket a few and finally end up shoving handfuls of chocolates into their mouths until they are sick. 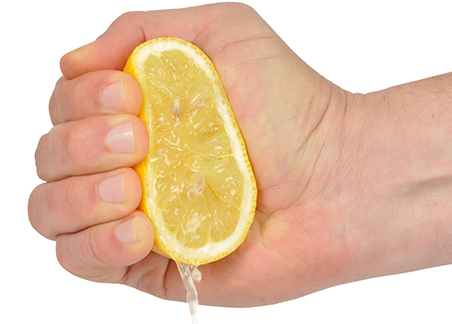 Well, it might be okay at the outset to make lemonade when life hands you lemons, but in the long run all you end up with is a sticky mess that doesn’t quench your thirst! Also, as your boat floats off course on a sweet and yellow sea, you are so busy with processing lemons that you take your eye off the horizon—your goal—while your charts blur. Before you get sick of the lemonade analogy, bear with me a second more. There are two worlds we live in: The Big Picture and the Little Drama. We are always straddling them, probably while Heaven looks on taking bets. Which will we choose? Will we choose to be free and fulfill our most gorgeous, joyful, creative selves and live in community with other such individuals? Will we get distracted by all the lemons lobbed at us, consumed by the mundane and live a life making the best of sour situations—relationships, jobs, finances, the world? Many years ago, I had an epiphany. My role in life was to create beauty, peace, harmony—a world of loveliness—health, vitality, joy, and creativity. Let’s call it Eden. I didn’t at the time know how I was going to do this exactly, but I knew that there were plenty of people bent on ugliness, hate, war, greed, and abuse, and even more people who live unconsciously—not even knowing they have choices. They shrug their shoulders, shake their collective head, and squeeze more lemons. There are the terrorists, over there, igniting child suicide bombers with visions of the afterlife; there is the war machine, down there, which niftily keeps its populace distracted from the essentials lacking in such a resource rich society; there are bankers, everywhere, who play us like marionettes—yanking hundreds of thousands off their feet by playing shell games with their very life savings. And then there is the Big Pharma and the WHO, which short of killing us, thrive on continued illness of the body or malaise of the spirit. And the charge that runs through the wires of all that terror and uncertainty is the ubiquitous voice of the media. I admit there might have been a thread of a rant in my recent writing. But it wasn’t until I witnessed someone close to me shedding the skin of a persona that was familiar but no longer served them, that I got the “aha” moment. As one listening to another as they stand shivering and vulnerable before new skin forms, I remembered what I have experienced so many times before. And that is: Just as you are about to take a leap into an uncharted and sparkling lagoon of self- actualization, you absolutely must shed all that does not serve you. Fear, doubt, insecurity, negativity, attachment—all—gotta go! The parable about the camel, the rich man, and the eye of the needle isn’t about wealth keeping you from Heaven—it is that often wealth or some other form of attachment is a compensation for insecurity or lack of self-esteem that is hard to let go. We become attached to our stuff—our possessions, our relationships, our status, our “good” name. We think it protects us from an uncertain world. But all this stuff and status is the construct of the world described above—the Little Drama. Ironically this Little Drama plays out over and over again on a global scale. It affects the collective soul of humanity where millions of children starve on a planet that would supply our every need and desire if we didn’t hoard, modify, pollute or kill her bit by bit in our ignorance and avarice. This nightmare is largely driven by those whose agenda is self-serving, and peopled by the mostly unconscious and unquestioning. I’m not unconscious but sometimes I forget to remember. While I’m ranting about them, I’m not doing anything constructive about me. While I am busy making lemonade, my boat is slipping into the fast current with the others that are heading for the falls. Remember Marilyn Monroe in Niagara? Man, that movie scared me! How do you get back to the Big Picture and out of the slipstream of unconsciousness? Well, with a rubber band. In the world of the Little Drama you are playing against the house which business it is to win—at all costs. They know all the odds and angles and play them, for survival—their survival, not yours, and not the world’s. For a moment you might win a bit, even become intoxicated with the glamour and bright lights, but in the long run, you lose. This game isn’t about money or security: It is about freedom. The game is a losing game as long as you are kept distracted and uncertain—busy making lemonade, like a good little stoic, or Baptist, or Muslim, or New Ager. The rubber band? Oh yes. In this world bent on uncertainty, it is said the average person has an insecure or negative thought six or seven times an hour! If we know that we cannot plant a peach tree and grow an elephant, then we know, absolutely, that we reap what we sow. So if we have negative and insecure thoughts six or seven times an hour (more in the wee hours, from experience), how can we create a life of joy and abundance? We can visualize and have all the pictures we want of our hearts’ desires (Greek villas on the Aegean anyone?) but if we continue with unexamined mental activity, how close are we going to get to our dream? And what is our dream but an expression of all that we have in us to be? The ultimate fulfillment of our own perfect and unique Self, living in beautiful surroundings with people we love, creating a world of happiness? Just as I came upon the negative thought statistic, I did a little self- analysis quiz in a book. The book said to get someone who knows you well to help. So I asked Athan. I had answered the questions with my impeccable self-awareness and honesty, and just wanted him to affirm my clarity. “Positive, of course,” say I. “What?” I rejoin, incredulous and terribly hurt. “Well, you get there eventually—but you sure don’t start there,” Athan smiled. “See what I mean?” my beloved replied gently. When I shared this with my friend, she suggested I put a rubber band around my wrist, and every time I have a negative thought— snap it. Well, after the shock of the irrefutable fact that I default to negativity more than a little, you know what I discovered? First of all that snapping rubber bands hurts like hell. Second, people close to you think that it’s okay to snap your band for you if you miss a random comment. Third, I discovered a lot of the negative and insecure thoughts are not even my own! They are from sources beyond memory, from the news, from other peoples’ opinions, and reflections of a very warped world. In short, our thoughts keep us tethered to the world of the Little Drama. And in the Little Drama we are inevitably small and our dreams pinched and beyond reach. The fourth and most important thing I learned? 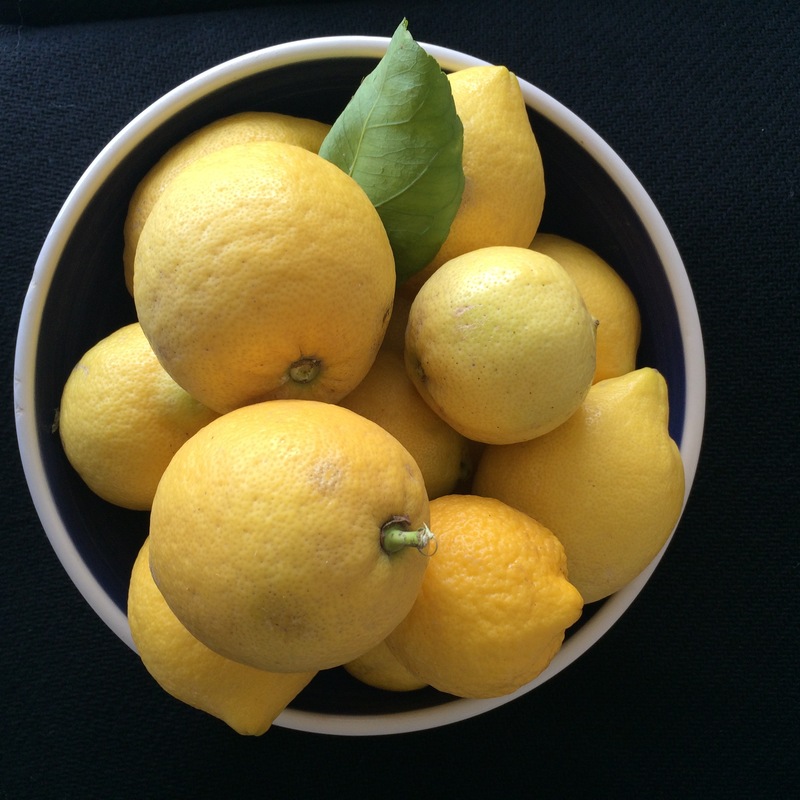 When I control my thoughts—every one of them—the lemons don’t keep hurtling at me. And when I stop making lemonade, there is no sea; there are no rapids, no falls. My goal—freedom—Eden—lies shining on the horizon and the way is on solid ground. In my hands right now is all I need to create the life I desire. In my heart is the hologram of all that I might be. So today I will concentrate on all the positive and constructive thoughts and actions I can take toward my own freedom. And what if I get snagged on the opinion of others, the wish for security over independence, or fear of the unknown? I’ll just snap out of it! “Exhilarated Life: Happiness Ever After”.